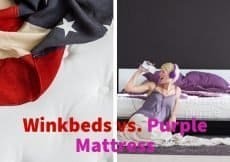 To each his or her own is an apt expression when it comes to comparing two major players in the bedding industry, After all, what feels firm to one mattress user might feel a bit too soft to another mattress user. Mattress manufacturers design their masterpieces to target specific types of sleeping preferences. Unlike selling a soda brand or even a standard four-door sedan, mattress manufacturing requires an incredible focus on detail to reach the right target market. Consumers are picky about what mattresses they like because choosing the best mattress goes a long way towards getting a good night’s sleep. Since we sleep (or we are supposed to sleep) between seven and nine hours per day, we spend about one-third of our lives in healthy slumber. By healthy, we mean sound sleeping habits restore energy, bolster the immune system, and in some cases, alleviate back and neck pain. Zinus vs Tuft and Needle compared pit two of the leaders in the bedding industry. Both companies manufacture mattresses that attract a loyal following, as well as plenty of detractors, as evident by online customer reviews and detailed analytic reports submitted by bedding industry experts. 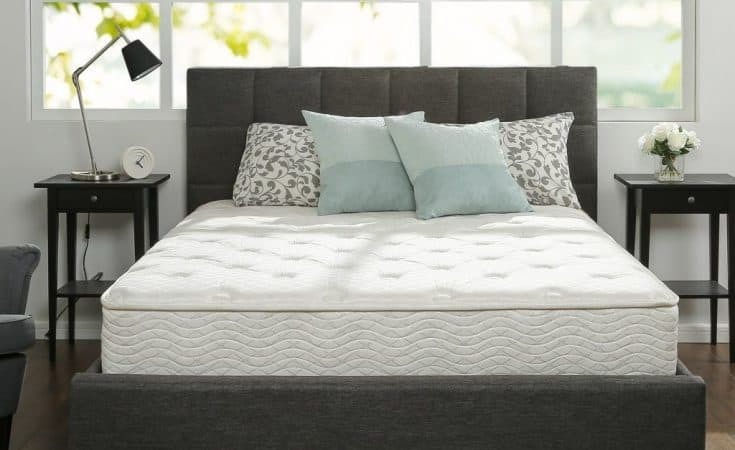 Before we dive into the mattress comparison review, let’s first review the important factors to consider before deciding which mattress to buy. After our comparison review, we offer a few helpful mattress buying tips. Our mattress needs change as we go through life. The slightly soft mattress we slept on in college no longer works for aging baby boomers that require firmer back support. You might have slept warm as a child and now you feel cool at night, even in the middle of summer. Although mattress manufacturers target different sleeping preferences, a few mattress manufacturers account for life’s subtle sleeping changes by offering more than one type of mattress. However, you should stick with mattress manufacturers that do one thing and do the one thing well. Unlike firmness, there is not a formal scale for measuring comfort. We like to mark the two ends of the firmness spectrum from plush to very firm. Every other type of comfort level falls between the two comfort extremes. Chances are you need a mattress that falls somewhere between plush and very firm. No other mattress factor plays a bigger role in determining how well you sleep at night than comfort. Some manufacturers design mattresses that automatically contour to secure your body position during sleep. Other manufacturers allow sleepers to roam free during the night all over a mattress. A growing number of mattress manufacturers help consumers select the right mattress for comfort by providing a standard bedding industry color chart. When bedding industry experts refer to mattress size, they typically refer to the width of a mattress. Of course, you do not want your feet hanging over the edge of a mattress, but more important, you need the width of a mattress to accommodate your body size. You also have to account for a partner, which eliminates the first two mattress sizes on the following list. To better serve customers, most mattress manufacturers customize mattress sizes to meet special requests. You can order a factory direct mattress that is a more than a foot longer than a conventional size mattress. Even if you do not sleep with a partner, you might share a bed in the near future or you move around enough during sleep to request a mattress that is wider than a California king mattress. What is Your Sleeping Style? This is kind of a trick question, as we know what position of sleep we start the night in, but who knows how we sleep throughout each night. We recommend answering the question with the sleep position you begin the night. Whether you start on your side, back, or stomach, your preferred sleeping position somewhat dictates the type of mattress you should purchase. For example, back sleepers prefer firmer mattresses that trap enough body heat to ensure optimal warm comfort throughout the night. Side sleepers need mattresses that automatically offer support for the curving of the spine during sleep. Body temperature fluctuates throughout the night, but many people sleep what bedding experts call hot or cool. No matter how far the temperature plummets outdoors, some sleepers love feeling cool under the sheets. Considered a common problem, sleeping hot typically occurs when the body makes the transition from the early stages of lighter sleep to the period of deep sleep that causes us to dream. Hot sleepers tend to sleep on pillow top or traditional foam mattresses infused with cooling gel. You have heard about the neck, back, and hip pain suffered by consumers that buy inferior mattresses. Mattresses that are designed too soft for certain consumers caused pressure points to flare up in sensitive areas. There is a direct correlation between mattress comfort and pain. Did you know some mattresses help reduce pain and are specially designed for chronic neck, back, and hip pain sufferers? You can also find a mattress that not only reduces chronic pain but also alleviates allergy symptoms such as sneezing and watery eyes. Zinus does an effective job promoting its standard mattress, as evident by the company greeting to visitors of its website. “Welcome to the world of wonder where mattresses are marshmallows and bed frames snap together in seconds.” We are not sure if comparing mattresses to marshmallows is a good idea since the reference implies every mattress designed and manufactured by Zinus is super soft. You do not want to alienate customers that want to sleep on firm mattresses. For its standard mattress, Zinus uses three layers to create 12 inches of height. Thicker than average mattresses typically create firm sleeping surfaces. However, the top three-inch layer exudes soft comfort by contouring to different body positions. Memory foam contouring is especially important to side sleepers that change arm and leg positions throughout the night. Three inches of transitional polyester foam follows the top layer to provide back and side support. Measuring six inches tall, the foundation layer does a good job of producing compression support. Strong compression support ensures deep sleepers remain in the same sleeping position during each change of the sleep cycle. For all the attributes of the three-layer design of the Zinus mattress, the cover causes the mattress to take a hit in the quality department. Mattress covers should welcome sleepers with a soft and cool feel to relax the body and mind. The Zinus mattress cover lacks stretchability, which creates a feeling like you are sleeping on a piece of thin plywood. In addition, fabric tension can cause the cover to rip and tear. Loose cover materials bunch up into positions that cause sleepers to toss and turn in discomfort. As the one positive attribute of the poorly designed cover, the mesh section encourages the circulation of air to cool the skin. Mattress firmness ratings run from one to 10, with 10 representing the firmest mattress possible. The Zinus foam mattress scores a firmness rating of six, which is right on the line between firm and neutral. After lying on the mattress for a couple of minutes, a 140-pound adult will notice the initial sagging disappear and the mattress rebounding to a more firm position. The initial sagging might turn off adults who weigh more than 140 pounds. 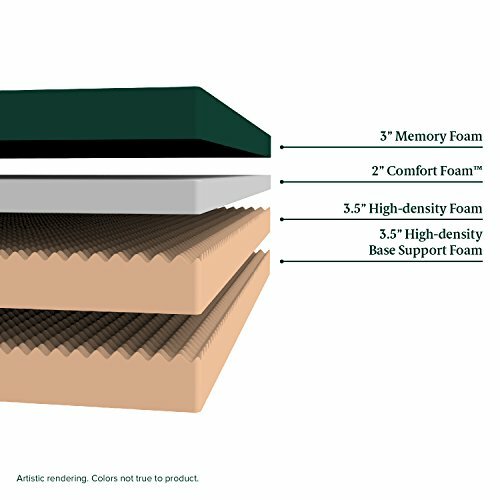 Without the firmer transitional layer, the standard memory foam mattress from Zinus would probably be labeled a soft feeling mattress. A 140-pound adult lying on his or her back should never cause mattress sinkage of more than 2.5 inches. Memory foam does an outstanding job of delivering pressure relief to sensitive areas of the neck, back, hips, and shoulders. The standard Zinus memory foam mattress continues the pressure point relief tradition. Plenty of foam within the top layer gently massages the parts of the body that are most susceptible to pressure point pain. With nine inches of two-layer poly foam support, sleepers of most shapes and sizes should enjoy the supreme comfort of the Zinus mattress. Nonetheless, the mattress sleeps warmer than it should, which can turn off consumers who need a cooling effect to help them transition into deep sleep. Although you should not experience much bounce from the Zinus memory foam mattress, you can expect to feel a level of motion transfer that might make the mattress unappealing to couples that sleep together. Like the epicenter of an earthquake, the center of the Zinus memory foam mattress absorbs and then releases pressure from the body in waves of motion. The result is a mattress that moves more than it should, which can disrupt the sleep of one partner when the other partner needs to get up during the middle of the night. For years, Zinus has offered a memory foam mattress that sits at the low end of the price range. You can purchase a new twin Zinus memory foam mattress for less than $300 (Check the latest prices here). A queen size mattress costs a little more than $300 (Check out the latest prices here! ), with the king and California king mattresses running about $400 (Check out the latest prices here!). The affordable mattress leaves some customers wondering if Zinus skimps on using quality materials to design and manufacture its signature memory foam mattress. The company quiets the doubters by offering a free 100-day home trial. Take a Zinus memory foam mattress home and sleep on it for more than 100 days to help you decide if it is the right mattress for you. Throw in Zinus free shipping and your next mattress can save you a considerable amount of money. Headquartered in Phoenix, AR, Tuft and Needle operate on the business principle that quality craftsmanship without design gimmicks represents the right way to design and manufacture a high-performance mattress. Tuft and Needle runs a 90-year-old, family-owned textile mill that produces its signature fabric. The company puts the finishing touches on each mattress at a compression facility located in Southern California. Many bedding industry experts that review mattresses claim Tuft and Needle has lost the competitive edge over brands such as Zinus. Let’s find out if that is true. Tuft and Needle design its flagship mattress with 10 inches of foam, which is two inches fewer than what Zinus designs for mattress thickness. Does the two-inch thickness difference make a big difference? It does when Tuft and Needle produces a mattress that contains only two layers. The difference in thickness and number of layers is apparent the moment you lie down on the Tuft and Needle signature mattress. Without a transitional layer, the Tuft and Needle mattress does not cool the body the same effective way the Zinus mattress cools the body. The foundation layer of the Tuft and Needle mattress spans seven inches thick, which produces plenty of support for most sleepers. If you carry above average weight, you might find the support provided by the foundation layer to be lacking. In fact, we tested the 10 inches of memory foam using different weights and we discovered the foundation layer lacks the level of support delivered by the Zinus memory foam mattress. Our final assessment of the two layers concludes consumers can find better-performing mattresses made by other companies such as Zinus. After we were disappointed with the design of the two memory foam layers, we were pleasantly surprised by the softness of the Tuft and Needle mattress cover. The thin design of the cover gives the mattress a comfort edge over thicker types of mattress covers, including the mattress cover created by Zinus. Thin mattress covers allow you to have more contact with the top memory foam layer. If you sleep hot, you should enjoy the enhanced cooling effect of making better contact with the top mattress layer. However, thin mattress covers typically expose the body to an increase in pressure points. 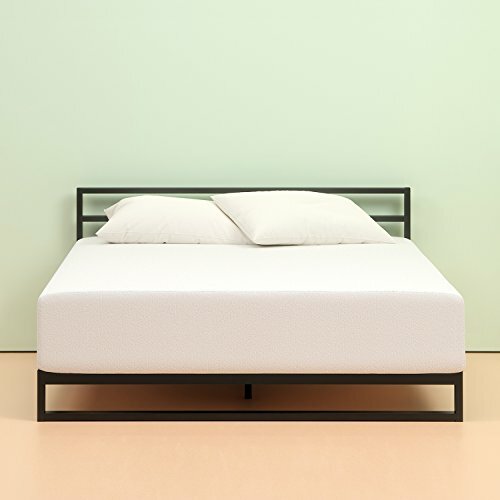 The standard Tuft and Needle memory foam mattress rates 6.5 out of 10 on the firmness scale, which makes it a bit firmer than the memory foam mattress offered by Zinus. 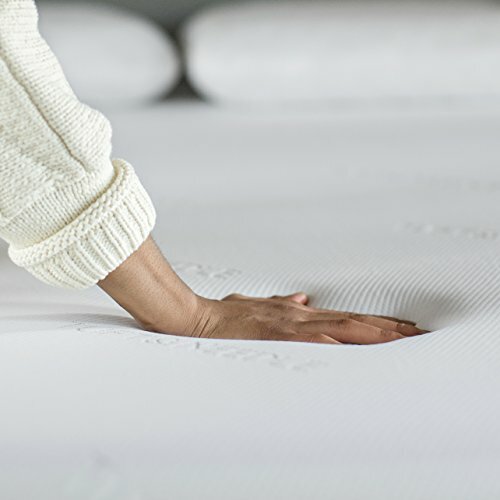 Tuft and Needle have decreased the firmness of the company’s flagship mattress over the years, with the mattress at one-time rating as high as eight on the firmness scale. Tuft and Needle decreased the firmness of its mattress to appeal to a larger group of consumers that spend the night sleeping in more than one position. The former version of the standard mattress appealed more to back sleepers. The Tuft and Needle memory foam mattress does not leave a favorable or unfavorable impression when it comes to judging comfort. With just two layers, the response of the top layer to body impacts is not immediate, but it is not a delayed response as well. We felt some sinkage in the middle of the mattress, but once again, not enough sinkage to proclaim the mattress uncomfortable. 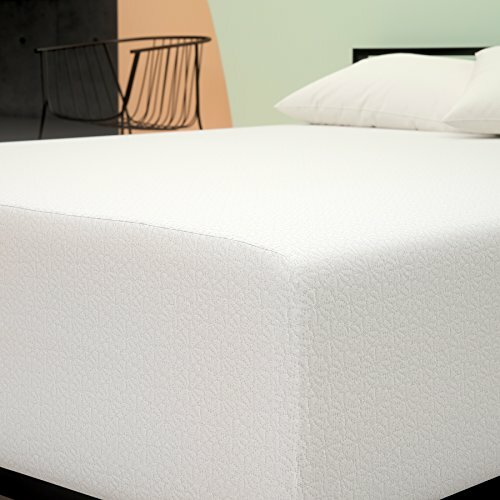 The streamlined design of the two memory foam layers detracts from the performance of the mattress. By trying to save money to pass on to consumers, Tuft and Mattress have created a mattress many consumers might want to pass on. 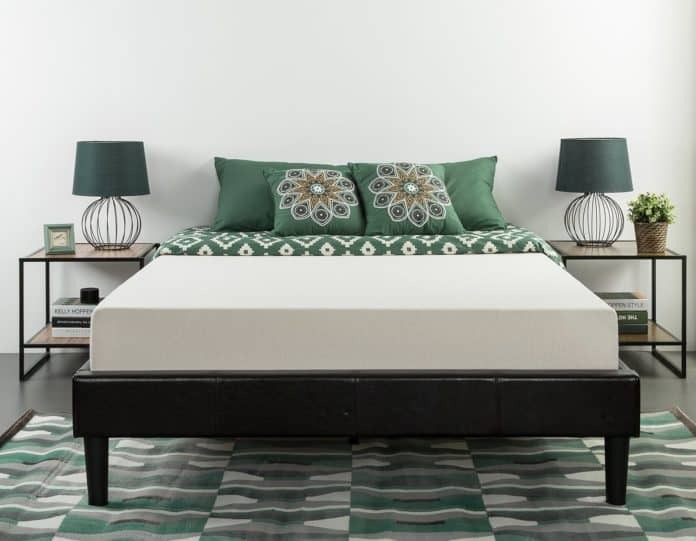 Despite simplifying the memory foam layers design of its standard, mattress, Tuft and Needle sells the mattress for much more money than what it costs to buy any size version of the Zinus memory foam mattress. At around $400 for a twin (Check out the latest prices here! 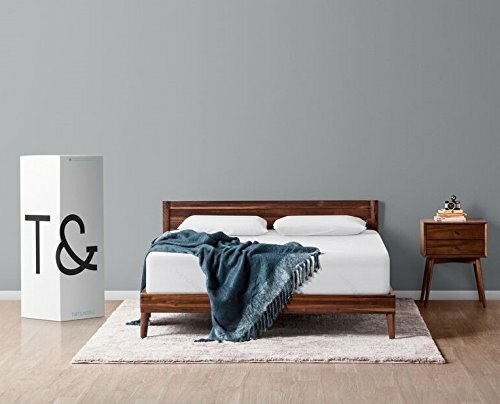 ), Tuft and Needle charge more money for its smallest mattress than Zinus charges for the largest version of its standard mattress, the California king. If you want to purchase a California king mattress from Tuft and Needle, you need to fork over nearly $900 (Check out the latest prices here!). The company offers free shipping between one and five days. The 10-year warranty sits at the low end of mattress warranty length and the 100-day free home trial is the norm for mattress manufacturers. If this mattress comparison was a heavyweight fight,Zinus would knock out Tuft and Needle in the third round. 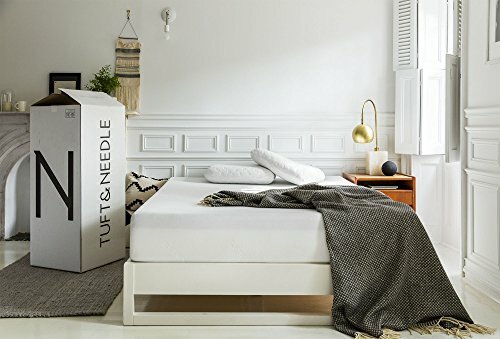 A few jabs by Tuft and Needle would keep the fight going early on, as Tuft and Needle earns points for creating a more comfortable cover and a mattress that produces less motion transfer. After Zinus shakes off the early mattress features advantage, it becomes clear the company designs and manufactures a much better mattress. The flagship Zinus mattress has three layers of memory foam thickness that hits the one-foot mark. With two fewer inches of thickness, the Tuft and Needle mattress does not provide the same consistent level of firmness the Zinus mattress delivers. Moreover, the Tuft and Needle mattress does not include the important transition layer that moves sleepers from feeling soft comfort to enjoying firm support. By costing less and offering more positive features, choosing the Zinus mattress over the Tuft and Needle mattress should be an easy decision for consumers to make. Performing research should be the first item on your mattress shopping to do list. By research, we mean visiting sites such as Google and Facebook to read the reviews left by customers. We hope this comparison article will give you enough information to at least look more into what the Zinus mattress has to offer. After you complete the research phase of the mattress shopping process, the time has come to put down the mouse and turn off your computer. The convenience of buying products and services online should not be a factor in how you go about choosing the right mattress. You need to visit one or more bedding retailers to find out how each mattress on your short list feels. Make sure to lie on each mattress under consideration for about five minutes. Test the mattress in the sleeping position you prefer, as well as at the edge and in the middle of the mattress. Sleep studies have concluded that most consumers do not need 100 days to determine the compatibility of a mattress. You might discover the best mattress for you during your first in-store visit. When you buy a mattress, you do not have to sign a legally binding contract. However, you must sign an agreement that describes two important points: warranty and return policy. Most mattress warranties last between 10 and 25 years. You should confirm the length of a mattress warranty and make sure the manufacturer has not tucked in any warranty restrictions within the fine print. You also must know whether the manufacturer issues full cash refunds for returns or defrays the cost of buying another mattress designed by the manufacturer. Some mattress manufacturers tuck in a 15% restocking fee within the fine print. Unless you plan to haul a mattress from a store to your home, the true end of a mattress transaction unfolds on delivery day. As an incentive to purchase a mattress, most retailers offer free delivery. The issue is not finding an unexpected delivery charge on the final bill, but finding a mattress that is not what you ordered. Make sure you receive the mattress size you ordered, as well as any features requested from the manufacturer. You should see a label that reads “All new material.” If you find anything wrong with the mattress, make sure to contact the manufacturer’s customer service department immediately. Outside of purchasing a home or car, buying a mattress represents the most important decision you will make as a consumer. Do your homework, but most important, know exactly what you want in a new mattress.